I'd rather be nine people's favorite thing than a hundred people's ninth favorite thing. That's a line from the brilliantly funny musical about musicals [title of show], and it's also my new goal for this blog. Since I started Cherry and Spoon about nine months ago, I've been trying to figure out what I want it to be, what my goals are, and why I'm doing it. How do I measure success - monthly page views (1000+), number of followers (9), number of Facebook likes (28)? [title of show] says just do something for the love of it and don't worry about pleasing everyone. Don't settle for mediocrity, and even if most people think you're weird or crazy, maybe nine people will love it. And that's a pretty cool thing. 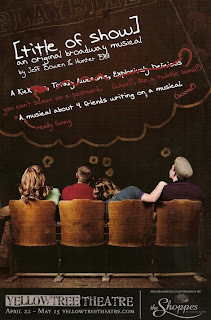 [title of show] is "a musical about two guys writing a musical about two guys writing a musical." It was written by Jeff Bowen and Hunter Bell, aka "two nobodys in New York," as an entry into the New York Musical Theater Festival in 2004, where it was accepted for production and later went on to play off and on Broadway. Hunter and Jeff are the main characters, and the show chronicles its own creation in a trippy "show within a show" kind of way. It's sort of like standing between two mirrors; you're not sure if what you're seeing is the real thing or its reflection. Hunter and Jeffy recruit their wacky and talented friends Heidi and Susan to help them create and star in the show. It's really about the love of musical theater and creation in general - creating something you love and watching it take off. There are so many musical theater references, from John Cameron Mitchell to Kander and Ebb to Shubert Alley to the magical number 525,600, that I didn't even catch them all, and I'm a musical theater geek! One of my favorite songs (I had to download the soundtrack after seeing the show) is "Original Musical," in which Hunter sings to Jeff about how hard it is to get an original musical on Broadway; it would be much easier "if it was a jukebox musical, a revival, or a recognizable commodity." I was nodding my head as the list of musicals based on movies went on and on and on. "So movies make good musicals? Well, they make musicals." (For a discussion of the jukebox musical vs. the original musical, see the footnote at the end of my recent Jersey Boys post.) Some other fun songs are "Monkeys and Playbills," which is almost entirely composed of the titles of obscure musicals, and "Die, Vampire, Die," which talks about those little voices inside (or outside) our heads that tell us we can't, and how to banish those voices. In a poignant moment, Heidi sings about living the life she dreamed of as a little girl in "A Way Back to Then." This show goes from the ridiculous to the sublime, and back again. 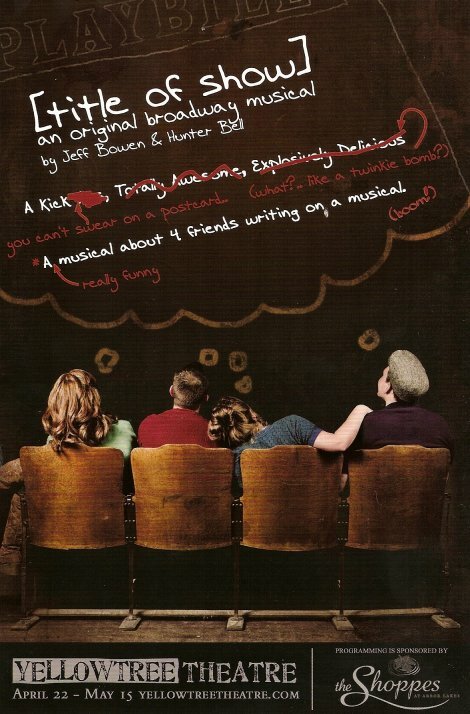 [title of show] is a perfect match for Yellow Tree Theatre - small and intimate ("just four chairs and a keyboard"), funny, quirky, and featuring great songs. Although I never thought I'd hear such a string of expletives coming from the stage of Yellow Tree Theatre. But I liked it. :) I've found that musicals that use the f-word are usually f***ing brilliant - RENT, Spring Awakening, Avenue Q, Bloody Bloody Andrew Jackson, Next to Normal (go see it at the Ordway, featuring the fierce Alice Ripley, hey that's the first time I've ever used the word fierce, and that's the second!). The four-person cast is comprised of four talented individuals who also have great chemistry and comfort with each other; they're really believable as friends. I knew Mary Fox (Susan) could sing from her recent appearance in Our Town, for which she also recorded a soundtrack with Blake Thomas. But I didn't know Jessica Lind (Heidi), co-founder of Yellow Tree, has such a gorgeous voice. Andy Frye and J.C. Lippold (who from his bio appears to be the Mr. Schue of Maple Grove) play Hunter and Jeff. They're both funny and natural and have great voices in addition to their wonderful chemistry together, and they rarely left the stage during the 90-minute show. The audience was clearly having a good time going on the journey to Broadway with this group of four friends.